Overview: The New Delhi Birth Cohort (NDBC) is led by Dr Santosh Bhargava, (Insert images C) Sunderlal Jain Hospital, New Delhi and Dr Harshpal Singh Sachdev (Insert image D), Sitaram Bhartia Institute of Science and Research. New Delhi. Other key investigators are Dr Lakshmi Ramakrishnan and Dr Nikhil Tandon (All India Institute of Medical Sciences, New Delhi) and Dr Dorairaj Prabhakaran (Centre for Chronic Disease Control, New Delhi). The cohort was set up prospectively in 1969 in order to study rates of low birth weight and pre-term birth and infant mortality. The babies were followed up throughout childhood and adolescence with measurements of height, weight and head circumference every 6-12 months, measurements which provide an exceptional record of their growth. The first study in adult life was in 1998-2002 at the age of ~30 years looked at the relationship between childhood growth and adult cardiometabolic risk markers. The cohort is now aged ~50 years and is currently involved in a study of cardiac structure and function, measured using echocardiography (the “INDECHO” study). 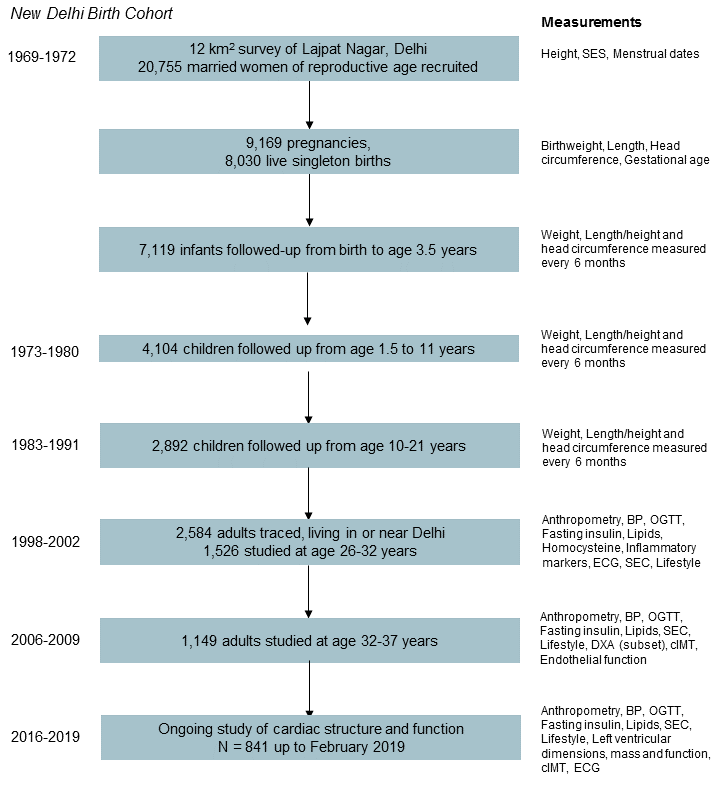 The New Delhi Birth Cohort is a member of the COHORTS collaboration of 5 birth cohort studies from Brazil, Guatemala, India, The Philippines and South Africa. It also contributes to the NCDRisC collaboration, which monitors global trends in NCDs in >19 million people in >180 countries. Objectives: The objective of the original cohort study was to describe birth weight and pre-term birth patterns and infant mortality. The collaboration between the MRC LEU and Drs Bhargava and Sachdev, started in 1995, and the cohort was re-traced to study the relationship of birth weight and patterns of post-natal growth with the later development of type 2 diabetes, hypertension, other cardiovascular risk markers (lipids and pro-inflammatory factors), in order to identify interventions and interventional windows in childhood to prevent later cardiovascular disease and diabetes. Further rounds of follow-up have repeated these risk markers, and have also examined other cardiovascular and NCD outcomes. Anthropometry has been measured in the children of the cohort, to study inter-generational changes in height and adiposity. Methods: In the initial study, women’s pre-pregnancy height and socio-economic factors were recorded. Women were followed up through pregnancy, and newborn gestational age was recorded and weight, length and head circumference were measured. Weight, height and head circumference were then measured every 6-12 months through infancy, childhood and adolescence. In 1998-2002, measurements included anthropometry, blood pressure, an oral glucose tolerance test, fasting insulin, lipids, pro-inflammatory markers and homocysteine, and an electrocardiogram (ECG). Data were collected by questionnaire on socio-economic circumstances, diet and lifestyle habits such as smoking and physical activity. In 2006-2009, many of these measurements were repeated, and additionally, endothelial function, carotid intima media thickness [cIMT] and body composition and bone health [using DXA] were assessed in a sub-sample. In the current study (“INDECHO”, 2016-2019) echocardiographic indices of left ventricular structure and function are being measured, along with repeat cardiometabolic risk markers and SES and lifestyle data.